Arabelle is the last living mermaid. She is discovered by rich American plastic surgeon HGV Bimbleton on the island of Caprea near Sicily. Bimbleton operates on Arabelle, giving her human legs, but she retains her ability to breathe underwater. (At one point in the saga, she temporarily grows two fish-like legs.) With her companion, reformed burglar Fleur Bleue, and her pet monkey, Kouki, Arabelle becomes involved in a series of light, romantic adventures. Arabelle was first serialized in the form of daily strips in the newspaper "France-Soir" from 1950 (starting on May 3rd) to 1962. In total, 3,350 strips were published. - The first series was entitled Arabelle la Dernière Sirène [Arabelle, The Last Mermaid] and ran from strip Nos. 1-1051, from 3 May 1950 to 18 September 1953, and contained a narration under the panels. Strips Nos. 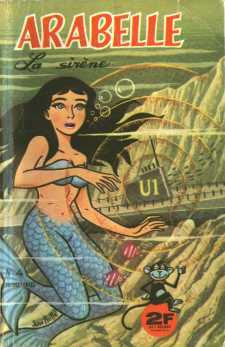 340-408, however, were subtitled Arabelle, La Dernière Sirène Chez Venus [Arabelle The Last Mermaid On Venus] (June-August 1951). In it, Arabelle and her friends travelled to Venus, helped make peace with the native Amazons and, back on Earth, launched a plan to settle Venus! - The second series ran from strips Nos. 1052-2550 (numbered 1-2499), featured word balloons, and lasted until 1962. The episodes bore individual titles. Additionally, in 1957-1958, the Sunday weekly "Journal du Dimanche" published 53 full pages. In 1967, the comics supplement to "Journal du Dimanche", "L'Illustré du Dimamche", published Grabuge sur l'Archipel [Battle On The Archipelago] (Nos. 17-24). 1. In 1964, Editions Denoel published "Paris by Night" (2nd Series, No. 11) as a regular mainstream paperback. 3. Finally, in 1978, publisher Glenat put out Arabelle La Dernière Sirène: Le Monstre du Tonsberg [Arabelle The Last Mermaid: The Tonsberg Monster] (2nd Series, No. 13) . In these, it was revealed that Arabelle was not the last Mermaid, and that other Mermaids lived secretly among men. Arabelle became the leader of her people. FOR MORE ABOUT JEAN ACHE, . Arabelle © 2001 Jean Ache. All rights reserved.